I love books that highlight relationships between women. and this book does it with two great characters. Each woman is very different from the other, but the bond that grows between them is wonderful gift to them both. I loved both Maggie and Lakshmi. While I did think they were both a bit broken, I did feel that Maggie was the more broken of the two and therefore she was the one I felt more sympathy toward. Lakshmi reminded me a lot of my sister who was also a Psychologist, because she too cared so much for her patients. Both women were well developed and I enjoyed following along with their friendship as it became stronger and stronger. The author gives so much emotion to the story…friendship, love, pain, betrayal, forgiveness and much more. I enjoyed the book a lot and want to read more from this author. Would I recommend this book? That would be a definite yes!! 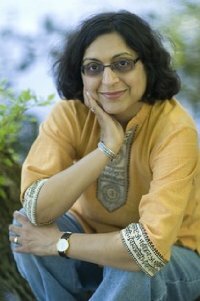 Thrity Umrigar is the best-selling author of the novels Bombay Time, The Space Between Us, If Today Be Sweet and The Weight of Heaven. She is also the author of the memoir, First Darling of the Morning. Her books have been translated into many languages and published in numerous countries.The Space Between Us was a finalist for the PEN/Beyond Margins award, while her memoir was a finalist for the Society of Midland Authors award. Thrity was recently awarded the Cleveland Arts Prize for midcareer artists.Thrity was born in Bombay, India and came to the U.S. when she was 21. As a Parsi child attending a Catholic school in a predominantly Hindu country, sh had the kind of schizophrenic and cosmopolitan childhood that has served her well in her life as a writer. Accused by teachers and parents alike of being a daydreaming, absent-minded child, she grew up lost in the fictional worlds created by Steinbeck, Hemingway, Woolf and Faulkner. She would emerge long enough from these books to create her own fictional and poetic worlds. Encouraged by her practical-minded parents to get an undergraduate degree in business, Thrity survived business school by creating a drama club and writing, directing and acting in plays. Her first short stories, essays and poems were published in national magazines and newspapers in India at age fifteen. After earning a M.A. in journalism Thrity worked for several years working as an award-winning reporter, columnist and magazine writer in America. She also earned a Ph.D. in English. In 1999, Thrity won a one-year Nieman Fellowship to Harvard, which is given to mid-career journalists. While at Harvard, Thrity wrote Bombay Time. The publication and success of the novel allowed her to make a career change and in 2002 she accepted a teaching position at Case Western Reserve University, where she teaches creative writing, journalism and literature. She also does occasional freelance pieces for national publications and has written for the Washington Post’s and the Boston Globe’s book pages. Here is the link to The Story Hour on Goodreads. Some purchase links: Amazon, IndieBound, and Barnes & Noble. Here’s the link to Umrigar’s website and Facebook page. Oh this book sounds very interesting. I’m adding it to my list. Great review. I noticed you are reading The Sparrow. A friend and I read it together and, although the novel seems like it starts off very slowly, the details laid down in the foundation of those early chapters is so essential to what follows, I never regretted reading through each and every page of it. Absolutely an unforgettable novel. I loved the one Umrigar book I read so I’m anxious to read this one. It sounds wonderful! Vicki, your review is wonderful and this sounds so good! I’d love to read The Story Hour by Thrity Umrigar; I am dreadfully behind in all of my reading ventures, though. 🙁 Your review brings that tried and true adage to mind, so many books, so little time. 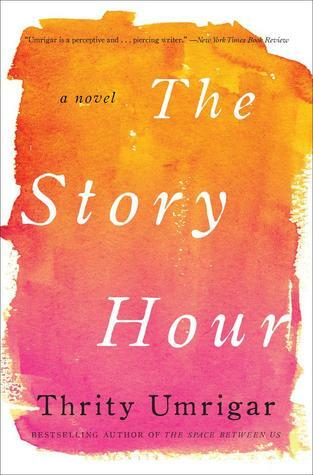 Can we have one extra hour each day, to devote solely to reading? Please? I have been seeing this one all over the place and it sounds really wonderful! I’m not familiar with Umrigar at all but I look forward to finding one of her books. I have not read Umrigar yet, but have a feeling I’d love her books! I’ve heard so many wonderful things about this author and yet I still haven’t read any of her books, I’m ashamed to admit. It looks like I’m missing out! I’ve enjoyed this author’s previous books and look forward to this one. Glad to know it was a winner for you. Thanks for your review! I read another review and promptly put this on my TBR. I love that more women’s stories across the world are coming out.